Banks – the most common method used, as they are thought of as a convenient method of transferring funds. The main drawbacks can include: high administration charges, uncompetitive exchange rates and a lack of expert guidance in particular with the transferring of money out of South Africa. Specialized money transfer companies – should always be consulted. They should be able to outline the options and potential issues associated with you transferring money into and out of South Africa. They tend to be the favored route by those seeking preferential exchange rates, convenience and a specialist service. Knowledge of foreign exchange control regulations – IT IS ESSENTIAL TO USE A COMPANY THAT IS ALSO ABLE TO ASSIST YOU WITH TRANSFERRING MONEY OUT OF SOUTH AFRICA AND IS AWARE OF THE FOREIGN EXCHANGE REGULATIONS THAT EXIST WITHIN SOUTH AFRICA. Better expertise, since they specialize in money transfers. Significant savings can be achieved: Foreign exchange dealers buy foreign currencies in bulk, and with that bigger amount available they can negotiate better exchange rates, directly on the markets. 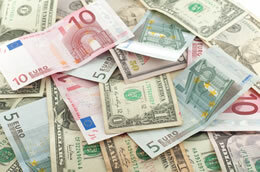 They can therefore usually offer a better exchange rate than banks will offer you. No administration fees – Banks usually also charge a fee for foreign transactions. Using a currency exchange company, your transfer to and from South Africa is more often than not free of any fees. A recent transfer enquiry showed that a money transfer out of South Africa of R2 million resulted in a client receiving ₤ 2, 667 more by using a currency specialist than using the quote provided by one of South Africa’s top 4 banks. In another case, money transferred into South Africa, a sum of €200,000, through a Dutch Bank, the client was worse off by R43,000 than if he had used a currency specialist to transfer his money into South Africa. The advent of specialists into the currency market means individuals now have the opportunity to secure better rates than the traditional method of simply using your own bank for the transferring of money. Contact us today for your free registration and engage a reputable currency transfer expert. Registration is necessary due to international money laundering regulations, but this process involves neither cost nor obligation to use our services. Registration can be done immediately and in effect simply allows you the opportunity to compare costs and rates when undertaking a currency transfer. A lot of our clients take advantage of the opportunity to register with us before moving to South Africa as well opening up our unique cash saving account, which has the added benefit of being able to opened whilst still abroad and can receive any money transfers. In doing so it allows you to transfer capital to South Africa whenever the exchange rate is in your favor enabling you to profit from the generally higher interest rates in South Africa. Also the added convenience of having your money waiting in South Africa on your arrival so that cash is readily available to purchase a car, a house or simply meet bills that need to be paid. Register with us today for expert advice, top rates and great service for transferring your money to and out of South Africa. Our transferring money in and out of South Africa services are provided in conjunction with Investec private bank and currencies direct.